Character’s Giant Greendale Playset is an expanded version of the Post Office Playset. 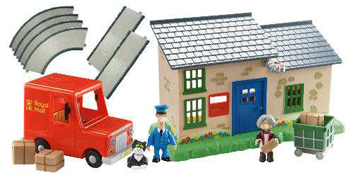 Included are Mrs Goggins and her Post Office, as well as Postman Pat, Jess, Pat 1, two parcels and a basic oval road track pack. With this playset you can recreate the village of Greendale in miniature.